Oil on Masonite, 25 x 30 ¼ in. Jessie Arms Botke made herself unique among American artists with her decorative compositions of wild and domesticated birds and foliage. The bird subject evolved out of work for Herter Looms where she designed decorative bird and foliate borders for furniture and murals. Her’s was not a sentimental affection for birds but an attraction to their silhouettes. 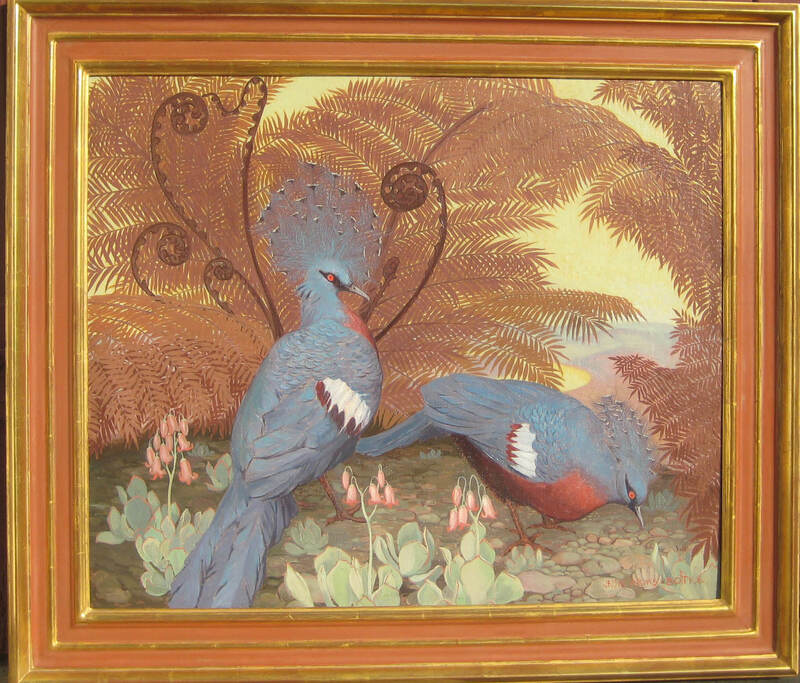 Over her career she painted many species, and Crowned Pigeons is a relief and a rarity from the seemingly hundreds of white peacocks, cockatoos, and cranes that were her mainstay. Depicted here is the Victoria Crowned Pigeon, as large as a hen turkey and one of three varieties of crowned pigeon that is native to New Guinea. Residing in California, Botke obtained her material from several aviaries (both public and private) which dotted the area. This painting is less decorative than some of her other pieces where the background is flat gold leaf as this one shows the birds feeding in a somewhat realistic three dimensional landscape of fern fronds and some species of blooming echeveria succulent. A label on the reverse identifies this painting as having been in the possession of and possibly exhibited at the prestigious Grand Central Art Galleries in New York, with which Botke had a long association beginning at least by 1930. Provenance, exhibitions, publications: Bonhams, December 10, 2007, lot 199; Private Collection, Surprise, Arizona; Grand Central Art Galleries, N.Y.